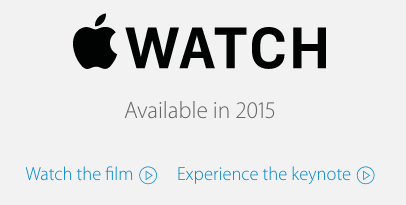 Apple’s websites for other countries such as for Australia and the United Kingdom also state “available in 2015”. Does this mean the Apple Watch will launch exclusively in the USA first, like we saw with Apple Pay? If that’s the case, then Canadians and the rest of the world will most likely be on the outside looking in again. If an international launch is scheduled after the USA, it would probably allow Apple more time to ramp up supply, but also drive intense demand for the watches on the grey market, especially in markets where luxury goods are seen as status symbols, such as China (18K gold Apple Watch Editions anyone?). Apple Watch has been described by Apple design chief Jony Ive as more challenging to create compared to the iPhone, due to “cultural, historical implications and expectations” for the wearable.